This “48DSD-S” bunded chemical store is on special offer at Chemstore this month – we are offering 10% off list price! The bunded store has overall dimensions of (L) 8,800mm x (D) 1,700mm x (H) 3,300mm. It is fully welded and leak tested, corrosion resistant coated and with steel stumps fitted under floor level. This store is designed for holding up to 12 no. Pallets 48, no. 200 litre Drums (or 8 no. 1,000 litre IBC’s) on two levels. Like all of our stores here at Chemstore, this is issued with a “Bund Test Certification.” The 3,600 litre capacity of this unit exceeds EPA & EA regulations, which state that the bund capacity should be a minimum 25% of the total volume stored. The store is brand new, and comes in the standard blue colour (as seen in the pictures). The unit is made with fully welded 2mm sheet steel, used throughout to maximise security. It is also fitte d with twin sliding doors that run on a Henderson Heavy Duty slide mechanism. The doors are fully padlockable and covered with a steel shroud, to ensure maximum protection from vandals. 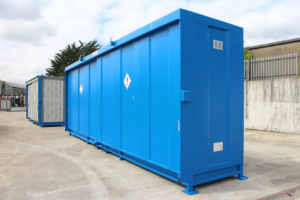 If the unit needs to be moved, it is fitted with forklift channels and has roof-fixed crane certified lifting points to allow for easy unloading and relocation. For more information on this special offer, quote “48DSD” to one of our sales engineers today.